Good morning. It's a great pleasure to join you today for the fourth Green and Social Bond Principles Conference. I'm pleased to note that the Conference is taking place in Asia - right here in Hong Kong - for the very first time. I'd say that underlines the rising prominence of sustainable and green investment, as well as the tremendous power of Asia in propelling the global economy. It speaks, too, of Hong Kong's stature as one of the world's leading financial centres. The green bond market has come a long good way in just over a decade. It debuted only in 2007, with the issuance of a "climate awareness bond" by the European Investment Bank. Last year, the global green bond issuance was around US$160 billion, 80 per cent more than the previous year. 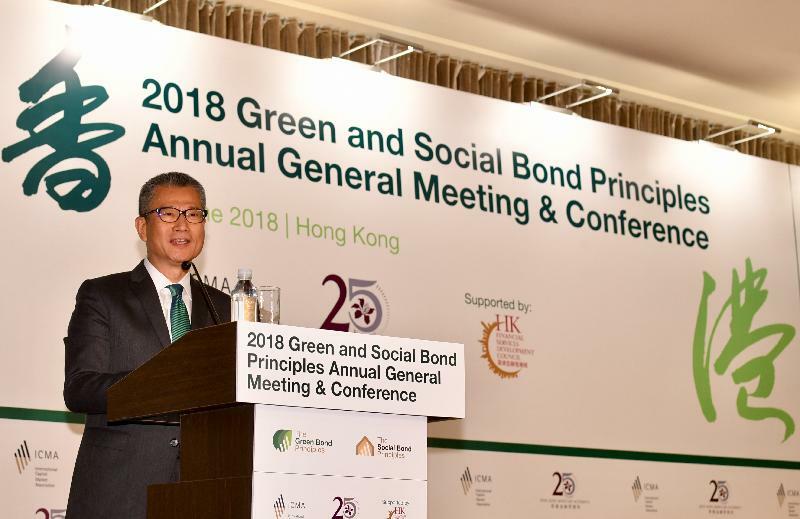 And China, the leading advocate of green finance at G20, issued more than US$23 billion worth of green bonds last year. Today, sovereign issuance accounts for about one-third of the total in both developed and emerging markets. I'm sure you'll hear more about this from the Hong Kong Monetary Authority today. That gives us a bit of a head start. More importantly, our financial services sector has long earned the trust - and the capital - of the international institutions and major corporations. We aim to build our reputation in the Guangdong-Hong Kong-Macao Bay Area, as well as the expanding economies under the Belt and Road Initiative. In short, ladies and gentlemen, we see green as the new gold not just for our economy but also for our community and our common future. I wish you all a very fruitful conference today.